The annual Sugar Creeks Arts Festival is proceeding, even in the midst of this record-setting heat wave. (You can see they were thinking ahead when they designed this year's poster, since it looks sizzling hot!) The good news is that it continues tomorrow, when the temps are supposed to be decidedly better. This juried art festival, which includes more than 135 arts and crafts vendors from across the country, takes place on the streets of Uptown Normal, on North Street between Fell and the Circle, and on East Beaufort Street between the Circle and Linden. Free parking is available in the College Avenue and Uptown Station parking decks. The 2012 line-up of artists includes people from as far away as Florida (photographer R.C. Fulwiler) and Colorado (ceramics artists Gint and Regina Sabaliauskas) as well as a lot of Illinois folks. Local favorites like painter Fernando Cornejo, photographer Alan Cring, glass artist Brock Eddleman, photographers Philip and Glenda Gangler, photographer Ryan Karns, painter John Madison, painter Michael McNeil, fiber artist Marcia Nagy, graphic artist Susan Palmer, painter Gina Perillo, sculptors Amanda Pierce-Ghahramany and Melanie Hunter, and jewelry artist Sue Pulido, are also on the roster. The event also includes entertainment, with the Sugar Creek Cloggers, Bend, Bloomsday Reunion and Sister Groove scheduled for today, and the Brian Choban Jazz Quintet, Small Potatoes, and the Sally Weisenburg Band performing tomorrow. 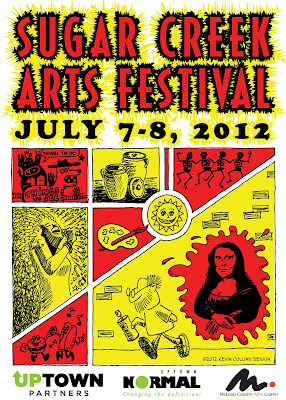 The Sugar Creek Arts Festival is organized by the McLean County Arts Center, the Town of Normal and radio station WGLT.